A luxury hotel in Frankfurt, Sheraton Grand Hotel & Towers is on the doorstep of one of the city's main shopping districts, as well as being within easy reach of its many attractions and business areas. 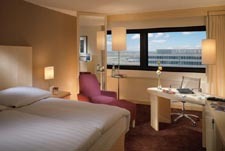 Offering excellent services and luxurious accommodations, Sheraton Grand Hotel & Towers is one of the finest hotels in Frankfurt for both vacation and business guests. Nearby attractions include Saint Bartholomeus' Cathedral, the Old Opera House and Römer, the magnificent city hall. Sheraton Grand Hotel & Towers offers several differing bars and restaurants for guests to enjoy during their stay, each providing fine dining and elegant surroundings. The Glass House - Light and airy, complimentary breakfast is served in The Glass House between 3:30 and 6:30 am. Flavors - For later risers, an excellent breakfast buffet can be enjoyed throughout the rest of the morning in Flavors. Taverne - A traditional and rustic steakhouse restaurant serving delicious local cuisine, and with a show kitchen where guests can watch their food being prepared. Lemons and Limes - Serving contemporary cuisine and with live entertainment, Lemons and Limes is a trendy and fun place to spend an evening. Sheraton Grand Hotel & Spa is the perfect location for hosting business events, meetings and conferences. The hotel has 56 function rooms of varying sizes available, many of which can be combined and adapted to suit practically any need.